It’s time for another The Music Entrepreneur HQ exclusive. You may already know how easy and affordable it is to distribute your music. But did you know your music may not be reaching people in China? Considering the size of the country, wouldn’t it make sense to get your music out to as many people as possible? Juri Kobayashi of Musicinfo shares about Musicinfo, a music distribution platform that can help you reach a new audience in China. Read on. I am part of the marketing team at Musicinfo where we brainstorm and devise our plan to get the word out about Musicinfo. We are a diverse group from around the world who are flexible in sharing work and supporting each other with our own expertise. We are all motivated in our work and passionate about music. 2. What is Musicinfo? How does it benefit musicians? 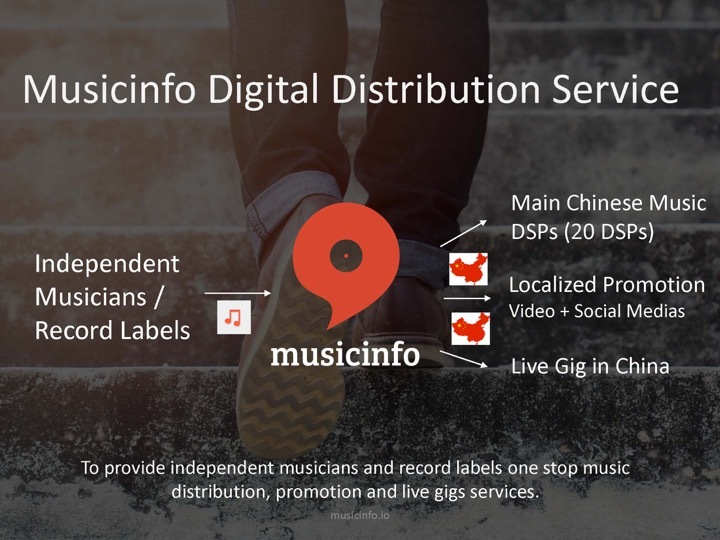 Musicinfo is a Finnish based digital music and social media distributor to China for global independent musicians. Musicinfo opens an enormous market for musicians from around the globe to share their music to a massive new audience in China. With the majority 82% of the global market revenue going to the top players, Universal, Sony and Warner (Buzzangle, 2017), independent musicians need an advocate so their music gets heard. Not only can our customers distribute their music and music videos to China and for those who already have their music in China; They can promote their music by using our promotion services and gain access to Chinese social media channels. You will be part of the privileged to acquire entrance into the palms of Chinese social media users, a place where Facebook, Twitter and Instagram are forbidden. 3. What’s unique about your music distribution and promotion service? Musicians can distribute their music to more than 20 of China’s largest streaming services such as QQ music, Kugou, Kuwo, NetEase, Baidu music and more, with a combined audience of over 720 million listeners. This is a virtually untapped market as western music and video services such as Spotify, Deezer, SoundCloud and YouTube are outlawed. For a reasonable service fee based on the quantity of music you would like to share, Musicinfo’s customers will collect 100% of the net accumulated royalties; Musicinfo’s services are covered by the subscription fees. 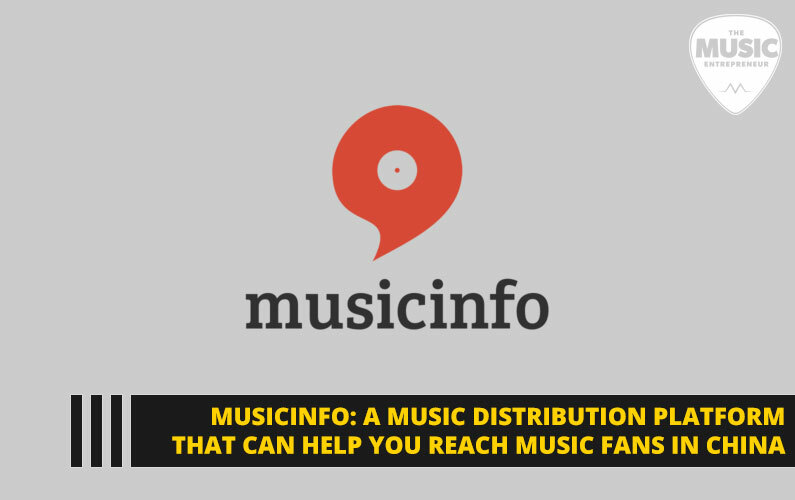 Musicinfo brings an exceptional opportunity for musicians to gain the adoration of a massive new fan base. When an artist’s music or music video is available to the Chinese audience our clients can promote themselves and their music with our Social Media & Video Promotion services. This is essential in a market where western social media services such as Facebook, Twitter, and Instagram are forbidden. Musicinfo’s promotion channels include the microblogging site Weibo, which will post the equivalent of Twitter and Tencent media promotion service, which will post your long post (500 words) with images to all the Tencent media channels, including the most popular social media services, Wechat, Tencent News, QQ Kandian and Kuai Bao, which covers 800 million monthly active users. Our promotion services also include video promotion. This is an exceptional way to promote your music and yourself as an artist; One of our client’s videos has already gotten over 2.7 million views! Your video will be uploaded to two of China’s most prominent video platforms: Tencent QQ Video with 280 million monthly users and Yinyuetai music video platform with five million daily users. 4. How important is it for musicians to distribute their music in China? What opportunities exist for non-Chinese artists? We all know as musicians it is hard to make a buck. It takes hard work to pour our soul into our music and then to squeeze blood from a stone, even more work to get our music heard enough to make it live for us. It is important to utilize all opportunities available and to collaborate with honest partners to acquire successful opportunity. China exults a massive 977 million music user audience. Each listener listens to an average of 16 hours of music a week, 66% of which comes from streaming services. As various music becomes available, listeners’ tastes become more distinct and diverse, gone are the days where pop ruled the scene, Three out of five artists from digital sales are independent. The core of any musician is to make music. The dream to make music grows in its evolution to expand and be heard and in its survival to maintain a constant creative flow must support its host. It thrives on acclaim and no better place to attain approval is from live performance. Musicinfo thrives to support independent musicians and their music and is standing by with gig operator contacts to help bring artists to their audience, because applause at your performance is our greatest success. I don’t know about you, but I’m convinced. Distributing your music to China could be a great way to diversify your income!